Photo Safari HQ | The central location for making your Photo Safari a success! Welcome to PhotoSafari.me — the premier site for all people seeking to ensure that your photo experiences are delightful successes! It is our goal to collect and disseminate a wide range of resources, information, and examples here. In order for this to have the most value, we implore you to contribute your best ideas, photos, stories, etc., as you think about the kinds of things that other people might want to know. Also, we encourage you to spread the word about this site. 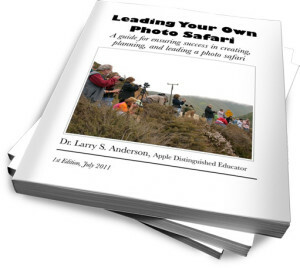 For starters, be sure you have downloaded your free copy of Dr. Larry Anderson’s eBook, Leading Your Own Photo Safari. Then, come back here and leave your comments, reactions, and suggestions. Please share this information with your photographer friends, too. Sorry to hear that you won’t be attending ISTE this year. This is my first year attending. I am a new computer teacher and one of my responsibilities (which I LOVE) is the yearbook advisor. I started this position mid year but I quickly discovered how many students are interested in photography. They love to photograph themselves and their friends!!! I’m a novice photographer but I’m interested in learning more. Thank you for the free book!